Does Ice Cream Go Bad? A super common question that we’re asked at Uncle Mike’s. Does ice cream go bad? Well, due to the fact that it is made of milk, then yes there’s definitely the potential for your ice cream to go off after some time. Though it won’t be immediately, this is an unfortunate inevitability that will happen, unless you take the correct precautions. Firstly, lets just clarify this; your everyday fridge won’t store your ice cream at a good temperature over larger periods of time. The freezers that we use at big ice cream parlours are different and the temperature can be adjusted different, which isn’t the norm for the majority of fridges in your house. Over time, this will lead to your ice cream becoming crystalized and ‘off’. One of the most common problems that will occur due to this is dehydration of your ice cream. This wil leave it too runny, and eventually it’ll turn bad due to the lack of oxygen in your ice cream. Again, this will in turn make your ice cream be termed as ‘off’. Of course, you’re probably here to learn how you can avoid your ice cream from going bad. There’s a few tips that I’ve picked up over the years which can help you to prevent your ice cream going bad. Make sure that your freezer is running at an optimum level of cold – The first thing that you need to do to make sure your ice cream won’t go bad is to make sure it’s at a good level of cold. This should be well below 0 degrees celsius. By doing this, you minimize the chance of your ice cream going off. Keep your ice cream in a seal tight container – Another preventative measure you can take is to make sure your ice cream is locked up tight. If it isn’t completely sealed, you do run the risk of letting oxygen into your ice cream, which will affect its long term shelf life. Don’t leave the freezer door open whilst you’re putting your shopping in – This one is an absolutely ice cream killer! That significant drop in temperature can have a big affect on your ice cream over time. Try to get your frozen stuff in there as quickly as possible! 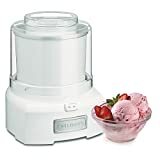 Use a top quality ice cream maker – If you want the best quality ice cream, you need to invest in a decent ice cream maker too. If you follow these instructions, you can be sure that your ice cream won’t go off within the first few months. Though I wouldn’t leave ice cream any longer than that personally, it should be good for a minimum of three months; if you take care of it. I know what you’re thinking.. can you eat your ice cream if it’s a little bit off? The answer is.. it’s all down to you. It’s pretty much the same as drinking milk past it’s sell by date, except with ice cream you won’t be able to taste the difference too much. Until your ice cream is reaaaally off.. then you’ll know about it! Ever wonder how ice cream is made from scratch?